Rovio Entertainment, founded in 2003, is an industry-changing entertainment media company and creator of the globally successful Angry Birds franchise. Angry Birds, a casual puzzle game, became an international phenomenon within a few months of its release and is now the number one downloaded app of all time. 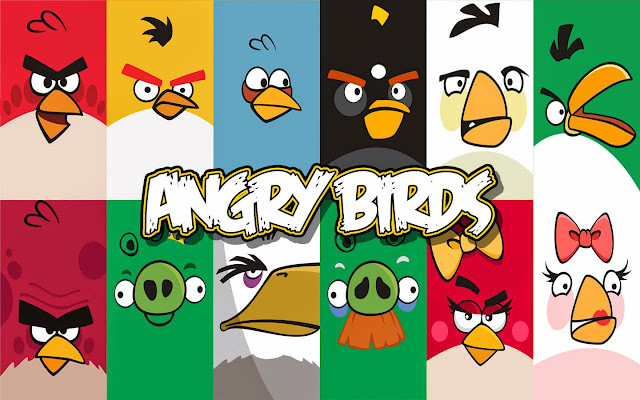 Rovio has launched numerous chart-topping games for different platforms: Angry Birds, Angry Birds Seasons, Angry Birds Rio, Angry Birds Space, Angry Birds Friends, Amazing Alex, Bad Piggies, Angry Birds Star Wars, Angry Birds Star Wars II and Angry Birds GO! In birds we have RED, BOMB, BUBBLE, CHUCK, MATLIDA, THE BLUES, TERENCE. Special characters in birds are STELLA, DHALIA, LUCA, POPPY, WILLOW, and the amazing GALE aka the bad princess. Red’s special skills are his leadership qualities, which at first seems feeble compared to the brute force of Terence or explosive power of Bomb. But wait! Someone has to organize this odd flock of birds! He’s also a bit highly strung and sees small things as a declaration of war – like hearing the sound of the wind and thinking it’s the battle cry of the pig army. So that’s kind of intense! Bomb’s main goal in life is to have fun. Everything else just gets in the way! Strategy meetings and chores – not so much fun. Blowing things up and playing tricks – now that’s more like it! He’s a relaxed fun-loving bird who’s always joking around with those mischievous Blues. So just imagine what the super-serious Red thinks of Bomb’s wacky and carefree antics! Bubbles is an odd little bird that’s perfectly happy eating tasty treats all day long. Chocolate, sweeties, ice cream, doughnuts, candy canes – you name it, he’ll eat it. Oh, you have your own candy and decide to hide it? Don’t bother, he’ll find it! He’d happily travel across the island if he thought a packet of chewy sweets was waiting for him. So I guess the point is he likes candy! Matilda’s the Mother Hen of the flock who sees the birds as her own little hatchlings – all needing her constant care and attention. She likes to fuss over the other birdies to make sure they eat their vegetables and go to bed on time. In Matilda’s mind the whole flock loves it when she interferes in every part of their lives. Who wouldn’t appreciate that? Well, it turns out everyone! Say hello to Jim, Jake and Jay: AKA the Blues! These fun-loving and mischievous little birds are identical triplets with identical personalities. But don’t tell them that – they get very upset when the birds can’t tell them apart! Jay has a hidden feather on his back that’s a darker shade of blue. And Jake has a slightly better sense of smell. So you see, completely different! Terence is one hefty bird. But he can somehow get off the ground and float through the air with all the elegance and grace of a two-ton bulldozer! He uses his boulder-like appearance and immense body weight to smash through the strongest piggy defenses. So he’s big, but also superfast with an odd ninja-like ability to just appear mysteriously from nowhere. It’s actually quite creepy! ONCE UPON A TIME ON GOLDEN ISLAND! Get to know a flock of fearless pals who have a strong bond – but even stronger personalities! Dahlia is a science guru and Golden Island’s one and only gadget geek! She loves experimenting with different materials and inventing useful structures, often with explosive results (don’t mention the solar powered tree house warmer). She’s a gardener too, and enjoys creating new species of exotic plants. Luca is the youngest of the flock, and also the only boy – just don’t call him a baby! He’s as playful and inquisitive as you’d expect a young bird to be, and loves exploring. However, this does cause problems when he wanders off and doesn’t tell anyone. Poppy’s wild, mischievous and crazy as a coconut! She lives life in the fast lane and is the group’s comedian – she loves playing pranks to make the other birds laugh. She’s definitely an attention seeker and the group sometimes lose their patience with her if she takes her practical jokes too far (like the time she dressed Dahlia up as a pig when she was sleeping). Willow’s a lover not a hater and also the artist of the flock. She lives in her own ‘Willow World’ – as a daydreamer she often has grand ideas, but can’t always follow through! It ruffles her feathers to see those pigs behaving badly and destroying their habitat. Gale is Stella’s former best friend, until one day when they fell out and went different ways. She earned the nickname Bad Princess when she put on the Crown to control the Minion Pigs. She’s obsessed with the mysterious Golden Egg, and spends most of her (and the pigs’) time looking for it. In piggies we have CORPORAL KING, KING PIG, MINION PIG, FOREMAN PIG. This militaristic pig fights for the King and glory of the Piggy Kingdom. There’s just one small problem though: he’s never actually won a single battle! Corporal Pig’s great at shouting orders and using fear to keep the minions in line. But he’s less good at inspiring the troops, learning from past mistakes, or putting together any kind of sensible tactics or defensive strategies! Meet the meanest, greediest and most childish creature on Piggy Island! This lazy swine takes 14 naps a day, and to avoid exercise insists on being carried around by his minions while being fed junk food. His golden crown gives him the power to rule over Pig City, but if it disappears then so does his authority. Without the crown he’s just a normal pig with a large belly and green snout! The birds may see these guys as Bad Piggies, but the truth is they aren’t so bad after all! Blindly loyal to the King…yes. Largely clueless…double yes! But actually they don’t like fighting or causing trouble – instead preferring to roll around in muddy puddles and generally goofing around with each other. They do exactly what they’re told and this is what gives them such a bad name! Foreman Pig’s a stubborn old hog who thinks he knows best. As the foreman of the group, he organizes all the construction projects and always forces through his own ideas – even if they’re terrible! Fortresses without walls or houses without foundations, anyone?! But when these wobbly buildings collapse, he blames the minions for not following orders properly! Did you like their biography? Who’s your favorite – bird or piggy? Why dont you try out their ultimate games, although we are still waiting for Rovio to release its latest game in the series, Angry Birds Transformers, for Windows Phone.Join the adventure save some eggs,blow some rockets, Yes all games are absolutely by Free! !